Immunoprecipitation of Akt from HeLa cell extracts using Rabbit (DA1E) mAb IgG XP® Isotype Control (Magnetic Bead Conjugate) #8726 (lane 2) or Akt (pan) (C67E7) Rabbit mAb (Magnetic Bead Conjugate) (lane 3). Lane 1 is 10% input. Western blot analysis was performed using Akt (pan) (40D4) Mouse mAb #2920. Akt (pan) (C67E7) Rabbit mAb (Magnetic Bead Conjugate) recognizes endogenous levels of total Akt protein. This Cell Signaling Technology antibody is covalently immobilized to 1-Ethyl-3-(3-dimethylaminopropyl)carbodiimide (EDC) activated carboxylated magnetic beads through its amino groups. 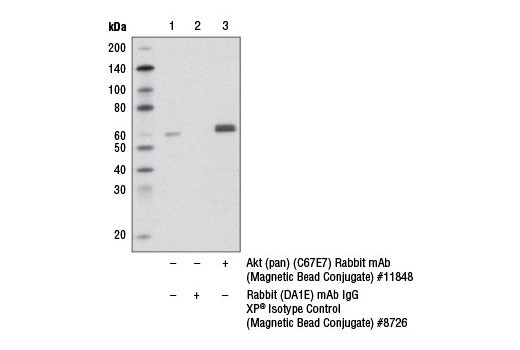 Akt (pan) (C67E7) Rabbit mAb (Magnetic Bead Conjugate) is useful for immunoprecipitation assays of AKT proteins.